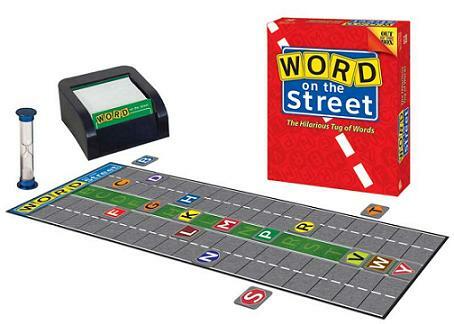 images © Out of the Box Publishing, Inc.
"Video demonstration for Out of the Box's game Word on the Street"
Word on the Street is a easy yet challenging word game that is great for families and casual gamers! The rules are fairly simply, and the game plays fairly quickly in around 30 to 45 minutes. It scales well from 2 to 10 players, since you play in teams. The goal of the game is to be the first team to capture 8 letter tiles to win the game. The game is straightforward by having a board that looks like a “street” with all the letters tiles laid down in the middle at the beginning. Each team takes a turn drawing a category card, and they must spell a word correctly that relates to the category. So, if the category is a “Type of Fruit”, the team could say “BANANA”. They must then proceed to spell each letter and move the correct letter that is NOT captured towards their side of the street one section at a time. So for “BANANA”, the B would be moved one section and the “N” would be moved two sections closer to the spelling team. If the letter is moved all the way off the board on your side, it is now captured and can no longer be moved by the other team. You can still use captured letters to spell words, but it just means that you don’t get to move it and makes it harder to come up with words that have letters to be moved to your favor. This all happens in single turn before the timer runs out. If the timer runs out, the team stops spelling the word and cannot finish. It is possible that the other team can challenge the word chosen if the word is misspelled or doesn’t fit the category. If the challenge is successful, the letters are moved back to their previous position. If the challenge is unsuccessful, the challenging team loses their turn. There is a nice strategic aspect to the game of give and take as you not only try to capture letters for your team, but you are also trying to prevent the other team from capturing letters as well to buy your team time. The other team can also blurt out words not related to the category to throw the other team off. Some criticism of the game is that you can learn some “goto” words that are great for this game like “grasshopper” or “baseball” that could spoil the game for experienced versus inexperienced players. I don’t think it’s a valid criticism, because these “goto” words only work for very few categories that come up and they don’t come up that often. Also, not only does the category have to come up, but the board has to be set up with the correct letters on it to really capitalize on the right letter combination which may not be there due to the letters already being captured. So far, this has been a hit with my whole family that enjoys playing games. We have even had company over that has enjoyed it as well, so it has a broad appeal. I enjoy it over a game of Scrabble any day, because it’s fun and brings out the laughter more. The time limit keeps analysis paralysis in check. It’s a great way to test your kids spelling ability and help them out too, so I like the educational aspect as well. Social gamers should really love this game, because of the team play. Casual gamers should find it fun, since it’s easy to pick up and run with it. Family gamers can get into it with the children that can spell. Avid gamers should just get into it, because it’s just fun. Power gamers and Strategy gamers should look elsewhere. The concept behind this game is simple and intelligent. You choose words based on a category and spell it out using the letters on the board. Each letter used in the word allows you to move that letter one space closer to your side. Once they are off the board, the letter is yours, and the one with the most letters wins. It’s great for building vocabulary and spelling skills. The only problem: my kids never choose to play it voluntarily. It doesn’t really grab their interest. The board is not particularly attractive, but it’s functional. The letter tiles are nice and sturdy, the cards are average. Our board is permanently bowed ever since we opened it, which doesn’t interfere with game play but is still disappointing. If you’re into word games like Scrabble and Boggle, you’ll probably really enjoy this game. 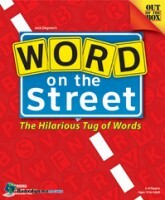 Add a Review for "Word on the Street"